A forgettable entry in the 'one-great-night' film genre plays like Generation Y version of “American Graffiti” or “Dazed and Confused”. It’s a warm and honest character piece that tries hard not to fall into cliché, or that Garden State earnestness. An aloof superiority threatens to creep in, resulting in an off-putting tone of early 90’s angst. Michael Cera plays Nick, a high school student and bassist for an unsigned hipster band. He’s just broken up with his girlfriend and still harbours some feelings towards her even though she has moved on without looking back. Norah is in the same boat with her boyfriend whom she just can’t say no to. Norah knows Nick via his elaborate and hopelessly romantic mix CDs he has given to his ex-girlfriend who attends the same school. They meet coincidentally after Nick’s show and spark a fun and rambunctious Before Sunrise-type relationship while they aggressively search for a mystery concert to be played by their mutual favourite band with a ridiculous name of “Where’s Fluffy”. Michael Cera is the ideal actor to play this role, but it’s also something we’ve seen from Cera before. His geek schtick is in full-force and for me his drole understated humour is more miss than hit. Like Martin and Lewis, he plays better against a Jerry Lewis, over-the-top comic partners like “Superbad’s Jonah Hill” or Will Arnett. And so the film is barely a comedy, and barely a drama – middle ground of self-importance which walks a fine line between thoughtful and just plain boring. Director Peter Sollett also suffers from having his soundtrack hipper and more enjoyable than his film. As with these abovementioned ‘one night’ flicks the music of the time and place is a character of its own. In this case it’s the indie-hip alt-rock music scene. Great tunes from “We Are Scientists”, “Band of Horses”, “Vampire Weekend” and the Dead 60’s” set the bar high which the content on the screen just can’t keep up with. 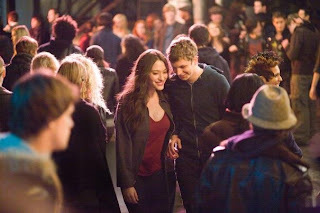 “Nick and Norah’s Infinite Playlist” moves from event to event, one hip location to another, consciously trying to tap into that idealistic fantasy which represents all the best moments of one’s high school memories. But perhaps I'm just too cynical.